A NEWLYWED couple who swapped their wedding shoes for running shows are gearing up to tackle the Two Castles run today. 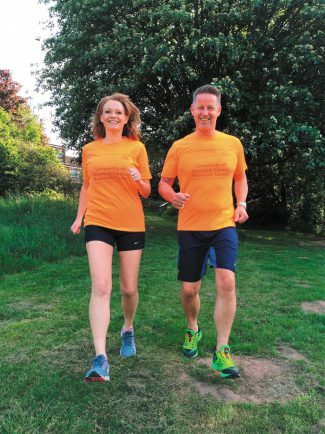 Roger and Rachel Grimes, both employees of the University of Warwick, are running the historic 10k route this today (June 12) to raise money for the University of Warwick Cancer Research Centre. It took a lot of persuading from regular runner Rachel to convince her new husband Roger – who had not run in over 20 years – to lace up his trainers once more and pound the pavements. But with their own wedding interrupting their training and a calf strain for Rachel preventing her from training, the spousal rivalry has remained friendly. “The new aim is just to finish,” Rachel said. The Research Centre at the University of Warwick is a leading unit that brings together mathematicians, physicists and engineers to further develop cancer research and was named the Lord Mayor of Coventry’s Charity of the Year for 2016/17. Professor Peter Sadler of the Research Centre, said: “Every donation, however small, helps us to pursue as fast as we can new approaches to treating cancer. “Recent Warwick discoveries have much potential especially for the treatment of resistant cancers such as ovarian and colorectal and we have an excellent interdisciplinary team at Warwick working together towards clinical trials of these new treatments. “We value enormously everyone who contributes to this effort. The Two Castles race starts inside Warwick Castle and follows a 10km course that finishes inside Kenilworth Castle on Sunday, June 12.